Cátia Rosário, CIPES researcher, will be the speaker at the Seminar “Models of Structural Equations Applied to the Analysis of the Economic Growth of Portugal”, on November 29, at 6:00 pm, in Room U.0.3, at the Campus of the Lusófona University, in Lisbon. Structural equation models (MEE) are statistical models that allow the quantification of cause and effect relationships described by a theoretical model, bridging the regression analysis, path analysis and factor analysis. Its application to Portugal’s economic growth allows establishing the relationship between the Human Capital and Innovation dimensions and its direct and indirect impacts on the country’s economic growth. 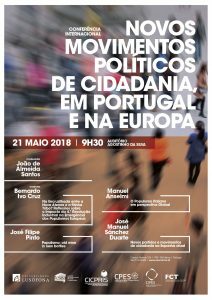 CICPRIS will host an International Conference on New Political Movements in Portugal and Europe, on the 21st of May, at 9h30, at Agostinho da Silva Auditorium, at ULHT Campus, in Lisbon. Moderated by João de Almeida Santos, dean of FCSEA and Researcher in charge of CICPRIS, the panel will count with Manuel Anselmi, Perugia University, José Manuel Sánchez Duarte, King Juan Carlos University-Madrid, Bernardo Ivo Cruz, True Bridge Consultancy, and José Filipe Pinto, Lusófona University. Framed as part of the research program about New Political Movements, this conference represents a further step on the process on the public debate about this important and current issue, with specialists form Portugal and abroad. These political movements are an alternative to the traditional political models, currently in crisis, serving as critical response to the system. Also, they are based on self-organizing and self-mobilizing citizenship movements that have appeared after the development of new Information and communication technology (ICT), and social networks. CPES will organize the Interantional Conference “Sustainability from an Economic and Social Perspective”, on November 15th and 16th, in Lisbon. 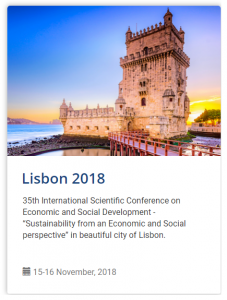 The event is a partnership with the 35th International Scientific Conference on Economic and Social Development, CICPRIS – Universidade Lusofona, GOVCOPP – Universidade de Aveiro, University North and Faculty of Management University of Warsaw. The first call for papers is open until September 5th. Abstract submissions must be in English and it should have between 250 and 300 words. Accepted papers will be published in the Conference Proceedings, but a selection of the best papers about Sustainability from an Economic and Social Perspective will be published on CPES Journal, Fluxos & Riscos.